Both cauliflower and green beans seem to taste best when served warm rather than piping hot, as in this salad. You can also use the purple or Italian green cauliflowers that are sometimes available, and a mixture looks particularly attractive. Cook the cauliflower and beans in separate pans of boiling salted water until just tender, then drain thoroughly. The cauliflower will take about 4-5 minutes; the beans 2-3 minutes. Refresh the beans under cold running water, then drain again. To make the dressing whisk together the mustard, 5 tbsp of the oil, and vinegar to taste. Season well, and stir in the herbs. When ready to serve, heat the remaining oil in a large non-stick frying pan and cook the onion gently for 4-5 minutes or until softened but not browned. Increase the heat and add the cooked vegetables, turning them over in the oil. Cook for 3-4 minutes or until they are heated through but still keep their shape. 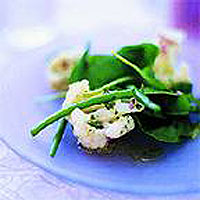 Turn into a bowl and toss with the dressing and spinach leaves. Scatter with the pine nuts, if using, and serve immediately. This salad can be prepared and cooked to the end of step 3 up to four hours in advance and then gently reheated in a frying pan.